The cruiser, CEYLON, built by Stephen and Sons, Ltd., Govan, was laid down on April 27th, 1939 as job number 1469. She was launched July 30th 1942 by Lady Dorothy Macmillan. (coincidentally, Lady Dorothy rededicated CEYLON in 1958 for her last commission) and commissioned 29th June 1943. with Capt. Amery-Parkes in Command and Cdr. Parish as Commander. The Royal Marine Detachment joined the same day, the 0/C being Capt. L S C Pickering, (Qualified Gunnery Officer at Whale Island 1942) and the Sgt G I was Sanders. She did her work up trials around the Isle of Arran in the Firth of Clyde and Scapa Flow. Whilst in the Isle of Arran area a section of the Marine Detachment were landed to search for a plane that had crashed in the hills. This they found, and the fatally injured pilot was stretchered down by them to an ambulance. At the completion of her trials, CEYLON was allocated to the Eastern Fleet, and went off to Plymouth, where she loaded a large amount of stores and baggage for the C-in-C, S E A C, Lord Louis Mountbatten. Leaving Devonport on the 30th of October, for the East Indies Station. she arrived at Gibraltar on November 6th, and was the next day sent to relieve GLASGOW on the Bay of Biscay patrol. Returning from this on the 14th. There was just time for one watch to have shore leave and in the early hours of the 15th. CEYLON sailed for Port Said arriving on the 19th November, transiting the Suez Canal the next day. She eventually arrived at Bombay on November 27th, 1943. After a period of 9 days at Bombay she sailed for Trincomalee. The next few months the ship alternated between Colombo and Trincamalee, a memory of Christmas Day 1943 being one of Standing To’ as it was thought possible that the Japanese might raid on this day as on previous Chrismas’s. . She served with the Eastern Fleet for the remainder of the war, going to Australia in January 1944, meeting up with the USS SARATOGA in March. The 16th April saw her take part in a major strike against Sabang, with a force under Admiral Somerville, which included the Carriers Illustrious and Saratoga. This force also comprised three Battleships (1 French), a Battlecruiser, six Cruisers (I RNZN & 1 Netherlands) and fifteen Destroyers (3 RAN, 3 USN, & 1 Netherlands). May took her to Exmouth Gulf (NW Australia) and the strike against Surabaya, Java. June was the month she carried out reconnaissance of the Andaman Islands and the strike against Port Blair. July saw another bombardment of Sabang, when for the first time the Eastern Fleet brought the guns of it’s ships into action against Japanese shore defences. In August she supported the Super Fort raid on Palembang and a strike against Penang. In September she went to Durban, leaving there on 9th December. In January 1945, she carried out strikes against Pangolin Brandon and Plumbing oil refineries. February saw her at Madras and Calcutta, returning to Trincomalee in the March. April she carried out a strike against Car Nicobar, and in May was cruising off the Andaman Islands. At the end of July, the Marine Detachment with those from the NELSON, NIGERIA and PHOEBE, were embarked on board the L S I’s Queen Emma and Princess Beatrix, and as Force Roma (some 400 Marines) under the command of Lt. Col. G B Grant, headed for Penang with the intention of invading a reported 3000 Japanese. Fortunately the intervention of the atom bomb raids on Hiroshima and Nagasaki forestalled this. The Force then landed on the 3rd September for a formal takeover. During this same period. CEYLON carried out various war patrols, until the Japanese surrender, CEYLON then proceeding to Singapore for the formal surrender of the Japanese in South East Asia to Lord Louis Mountbatten on the 12th September, 1945. Selected members of the ship’s company, formed part of the guard of honour for the ceremony. Later in the month she supported the occupation of Western Malaya. So ended the war for CEYLON. Since commissioning, she had steamed over 100,000 miles and spent most of her service based on her namesake island, Ceylon. In October she left the East for the United Kingdom arriving at Portsmouth on the 25th October. where she paid off into reserve at that Port. A most fond memory of the journey home was seeing CEYLON in Grand Harbour, Malta flying her paying off pennant. The final tally of her mileage on reaching home was 115,000 miles. CEYLON was in reserve at Portsmouth until 1950, when she was brought forward to relieve BIRMINGHAM in the East Indies Fleet. Refitting in the early part of 1950, she commissioned in April, (Capt. C F J Lloyd-Davies, D S 0, D S C, commanding, with Cdr. J M Palmer as Commander), sailing from Portsmouth on the 15th of that month. After a short stop in Gibraltar, she sailed for Malta for a month ‘work-up’, which she completed at the end of May. Sailing from Malta on the 29th May, she transited the Suez Canal on the lst/2nd June, and after a short stop-over at Aden, arrived at Colombo on the 15th June, sailing for Trincomalee on the 22nd, there hoisting the Flag of C-in-C East Indies. This was the month the Korean War broke out and on the 13th July, the ship was informed that she was to be ‘temporarily’ transferred to the Far East Fleet whilst BELFAST returned to the U.K. for re-commissioning. The 25th of July saw CEYLON off to Singapore. (exercising on the way, Korea in mind), for a short docking in the floating dock there, before sailing on the 10th August for Hong Kong and further exercises. On the 18th she sailed for Sasebo, only to be turned back after a few hours in order to pick up the Argyll & Sutherland Highlanders at the Kowloon Station Jetty. These troops and their equipment were landed in Pusan, Korea Tuesday 29th August and the following day CEYLON sailed for Sasebo. The 7th September saw CEYLON start her first patrol on the West Coast of Korea, during which time she participated in the Inchon landings, 15th September. On 5th October, at the end of her 2nd patrol, the extra ship’s company arrived board to crew her to wartime complement. The end of February 1951 saw CEYLON relieved by BELFAST in order to go to Singapore. via Hong Kong for a refit, arriving there 4th March. The command of CEYLON at this time changed to Capt G A Thring, DSO. This refit lasted well into April and on 27th of that month she sailed for Hong Kong and Sasebo, arriving 6th May. The 7th May she returned to further patrols in Korea, which was the general pattern of the rest of her commission. She had a good record of service in the Korean War, being finally relieved by NEWCASTLE on the 4th July 1952. Sailing for Singapore via Hong Kong, the ship arrived on the 14th July and was prepared for refit. The ship’s company were drafted to VENGEANCE on 22nd for the journey home, which started on 31st. They arrived at Portsmouth on 28th August, 1952. CEYLON recommissioned at Singapore for further service in the East Indies Fleet, and on January 1st, 1953 she was present at the inauguration of the Maldive Islands Republic. On February 13th, 1954 she arrived at Hobart, Tasmania from the East Indies to take part in the 150th anniversary of the first settlement in Tasmania and the visit of H M the Queen in S.S. GOTHIC, during the Royal Tour of Australasia. In April CEYLON escorted GOTHIC from the Cocos Isles, and was visited by Her Majesty on April 9th. The ship returned to Portsmouth on October 1st 1954 and taken in band for extended refit, completing this the 31st August 1956. She recommissioned September 11th. 1956 (Capt. Butlar-Bowden commanding), for the Home Fleet, but hurriedly left Portland on October 26th for the Eastern Mediterranean, where she was present during the Suez operations (Musketeer Reserve) in November, returning to the U K shortly after. In January 1957 she went to the South Atlantic, where on March 6th, at Accra, was present at the ceremony of Ghana’s Independence. Later in 1957 she moved to the East Indies and on October 15th was at Trincomalee for the handing over of that Naval Base to the Ceylon Navy, on Ceylon becoming independent. CEYLON returned to Portsmouth, December 5th. 1957, to spend the rest of this commission in the Home Fleet, flying the Flag of F 0 F Home. Returning again to Portsmouth, 31st March, 1958, to recommission. Recommissioning 15th April, 1958, (Capt. F R Twiss, D S C commanding), CEYLON refitted and sailed for the Mediterranean, and in October passed through the Suez Canal to Aqaba, where on November 2nd she took part in the evacuation of the last of the British troops which had been called to Jordan to meet the threat of invasion by Iraq. She transported Officers and Men of the 1st Battalion Cameronians to Mombasa where they arrived on November 9th. After disembarking the troops CEYLON left Mombasa for the Far East. Early in 1959 she flew the flag of F02, Far East Fleet, Rear Admiral V.C. Begg, she carried out guard duties for the Duke of Edinburgh’s visit to Singapore and Hong Kong. 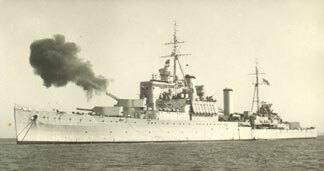 Between July and September 1959 she was again flagship on a cruise to Colombo taking part in exercise ‘Jet’ with Commonwealth Forces. CEYLON returned to Portsmouth on December 18th 1959. paying off 1st January 1960, when it was announced that she had been sold to Peru. Being formally handed over by the C-in-C. Portsmouth on February 9th 1960, and renamed CORONEL BOLOGNESI. As the B A P CORONEL BOLOGNESI, she went on for some time as a unit of the Peruvian Navy until decommissioning in 1982. She did sterling work in 1970 when a disastrous earthquake struck Peru, killing an estimated 50,000 people.